Eye On Sports Media: Will We All "Burn In Hell" For Posting the "Cowbell Girl" Video? Will We All "Burn In Hell" For Posting the "Cowbell Girl" Video? 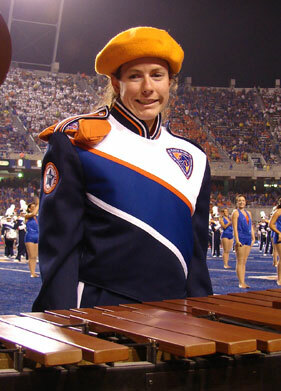 Last night, the Internet was abuzz with the video of the "sad cowbell girl" of the Boise State Marching Band. Even mainstream media bloggers such as Kyle Koster from the Chicago Sun Times wrote about it. Then a sense of collective guilt came about when it came out that the girl was blind. As I had posted the video as well, I had to sit back and think about it. Was it the right thing to do? I could only come up with the answer "Yes" for this publication, and this was after thinking back to something that happened back in 2000. At the time, I was working for IBM/Lotus Development corporation. I was up in Boston working on an internal project for Lotus Professional Services (now called IBM Software Services for Lotus (ISSL). During lunch one day, we were talking about writing for trade journals. The senior architect on the project spoke up and said that he had written for a couple of "crip" magazines. We asked what he meant. He said "you know, magazines for crippled people." Our jaws dropped in a moment of awkward silence. This was being said by a quadrapalegic living his life in a wheelchair. You see, this man did not want people to feel sorry for him. They wanted to be seen as the knowledgeable, experienced professional that he was. He wanted to live life on his own terms, not by a label that others might slap on him. Elias Sports confirms that a new record for meaningless crowd/cheerleader/band shots/missed snaps was set during the Fiesta Bowl. Aside from the (unintentional?) inside joke that Elias Sports has a tight relationship with FOX and Tim McCarver for baseball, this summed up the broadcast. I will write more about that separately. Let's get back to the cowbell girl. But before we do, here is a much better pictures of the unnamed young lady. When halftime came. FOX hyped how they were going to show the bands, as if they had not shown enough shots of them during the actual game itself. Boise State was up first, and this particular video segment was one of the first shots of many during the band performance that would and probably did make the watching audience wince. For me, this picture/video was the perfect symbol for the product that FOX put out last night: sad. Initially, I remarked on her apparent lack of enthusiasm for the cameras, but it's been brought to my attention by some jubilant -- and angry at the same time -- Boise backers that she's visually impaired. So, it looks like I'll be going directly to hell. If that's the case, it's an even better, even more enduring image. Play on, Cowbell Girl. Play on. If in fact she is blind (and there is no one in at Boise State to confirm this today), then all people did was not treat her with sympathy and kid gloves. They just saw her as a person with facial expressions, and a playing style, that matched what many in the viewing audience felt about the broadcast: it was sad and painful to watch. What if we had known she was blind, would that have changed our perceptions of the moment? Absolutely, but that might be doing her an injustice. Like the systems architect I worked with in Boston, would she want a kids glove treatment or would she like to be viewed at face value for just being another human being? I would hope that it would be the latter because the image is now seen in the context as one that shows pure, honest emotion. Why? Because if she did see the camera, would she have put on a fake "happy face" that did not allow her to feel whatever she may have been feeling at the time? Clearly, there are many out there that took it a bit too far. On this site, all we did was post the videos and a screen capture. We also had a couple of tweets, and a few retweets. Would I do it again? Probably, but it all depends on circumstances. I would never take it to the point that some did. People have to recognize that the Internet mini-boomlet of the image and video did not happen because people were trying to take advantage of a blind girl. No one knew. It was just the viral spread of a very funny moment in time.